Focaccia has become a national dish of Italy, and many regional versions can be found. This version is probably a cross between the local country cuisine of the Puglia region, where breads are enriched with the ingredients of the pastoral people – tomatoes, herbs and oil – and those southern versions adding cheese. This recipe makes a large, thick focaccia (it can only just be called a “flat bread”) filled with a variety of tasty, herby, melty, mouth-watering ingredients. Serve focaccia hot from the oven. Makes 1 thick, 25-cm (10-inch) bread. 1. Stir the dried yeast into 1/4 cup of the warm water. Sprinkle in the sugar and leave in a warm place for about 10 minutes, or until frothy. 2. Sift the flour, asafetida and salt into a large bowl. Pour in the frothy yeast mixture, the olive oil and the remaining water. Mix well. 3. Knead on a floured surface for 8-10 minutes or until the dough is velvety soft. Place the dough in a lightly oiled bowl and cover the bowl with oiled plastic wrap. Leave the dough in a warm, draft-free place for about 45 minutes, or until doubled in size. 4. Punch the dough down and remove it from the bowl. Place it on a lightly floured surface and knead it briefly. 5. Divide the dough into two equal portions. Roll out one portion to a 25-cm (10-inch) disk and place it on a well-oiled baking sheet. 6. Sprinkle on half the cheeses leaving a 1/2 inch (1.25 cm) border of dough. 7. 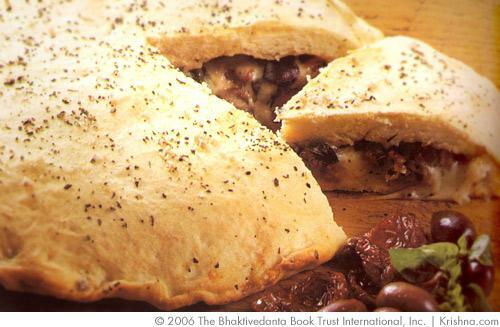 Evenly cover the cheese with the olives, sun-dried tomatoes and basil leaves. Drizzle over the oil from the sun-dried tomatoes, and sprinkle on the black pepper. Cover with the remaining cheese. Moisten the outer border of exposed dough with water. 8. Preheat the oven to 430 F/ 220 C.
9. Roll out the other portion of dough to exactly the same size and carefully place it on top of the filled base. 10. Tightly seal top and bottom, making sure no filling is exposed. 11. Brush the surface of the focaccia with olive oil, and sprinkle with basil and the optional sea salt. 12. Place the focaccia in the center of the oven. Bake for 30 minutes or until top is golden brown. 13. Remove and carefully place the bread on a rack to cool, or cut into wedges and serve immediately. Note: For variety, try adding 1-2 cups of one or more of the following fillings: thinly-sliced grilled or pan-fried zucchini, steamed or pan-fried tender asparagus, capsicum (pepper) strips, grilled or pan-fried eggplant slices, marinated artichoke hearts. Submitted by Anonymous on Tue, 02/07/2012 - 22:44. Please don't be offended but I would like to point out that yeast should not be use in breads served to Krishna. Also most cheeses have animal renit to set the cheese. This is also not to be served to Krishna. We can not eat. Try making flat unleavened bread and paneer cheese using lemon to curdle the cheese, much tastier. Please think of Krishna and Bhakti devotion. Submitted by radha on Tue, 11/20/2012 - 19:38.